Visitors to the Reflections Program enjoy a gallery visit led by a Nasher Educator. When you get finished with it [a Nasher Reflections tour], it’s like you’re renewed and regenerated. With this Alzheimer’s thing, you could really get down, but what happens with our group is we know that all of us know that we’re having problems, but we’re supporting each other. 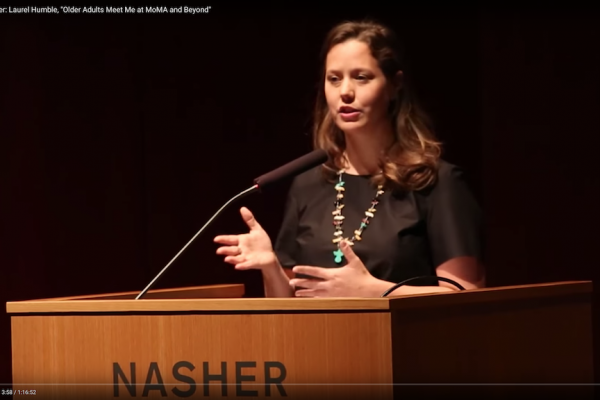 Reflections: The Nasher Museum Alzheimer’s Program provides engaging and interactive museum tours to visitors with Alzheimer’s disease and related dementia, their families, and their care partners. 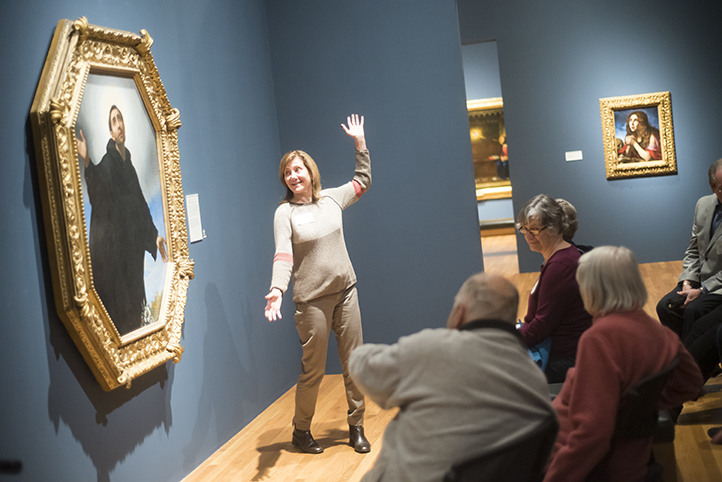 Reflections tours include guided discussions through the galleries, as well as live musical performances or hands-on art experiences. 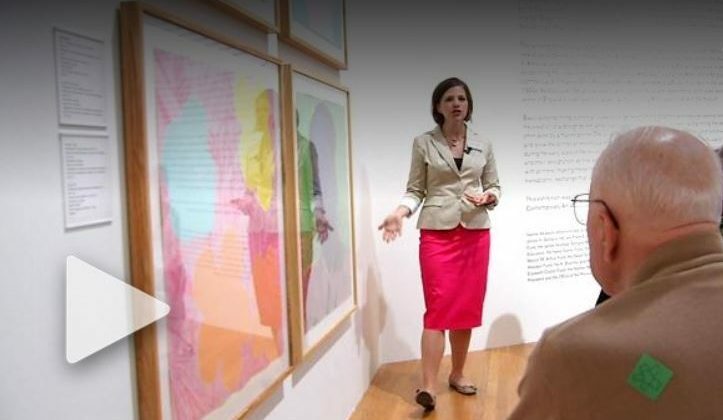 These special tours offer people who live with memory loss and their families the opportunity to enjoy art in the moment and to engage with the current exhibitions using multiple senses. Tours are inspired by the Meet Me at MoMA model. 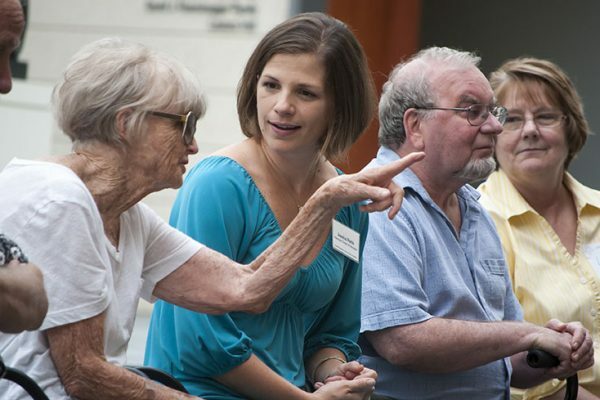 It can be difficult for individuals with Alzheimer’s to find welcoming communities where they can engage and socialize without the fear of judgement or the stress of a strange situation. Programs like Reflections offer spaces where individuals with dementia can comfortably discuss new ideas and enjoy spending time with others. For more information about Reflections Program tours, please contact Brittany Halberstadt, Education Assistant for the Reflections Program, at reflections@duke.edu. 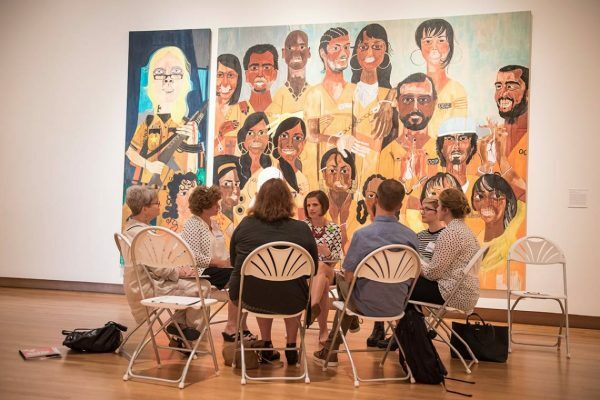 The Reflections Program began in 2014, with Nasher Museum educators offering tours in partnership with the Duke Family Support Program. Tours were specifically designed for individuals in the early stages of Alzheimer’s. 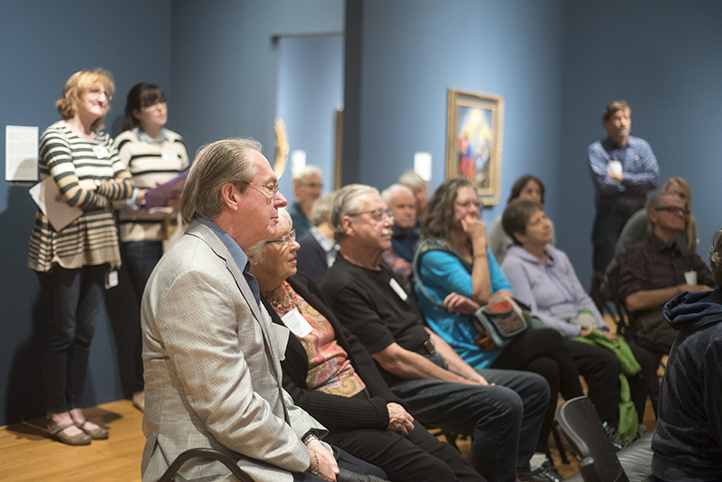 Reflections tours expanded in the summer of 2015 to include individuals with mid- and late-stage Alzheimer’s disease. 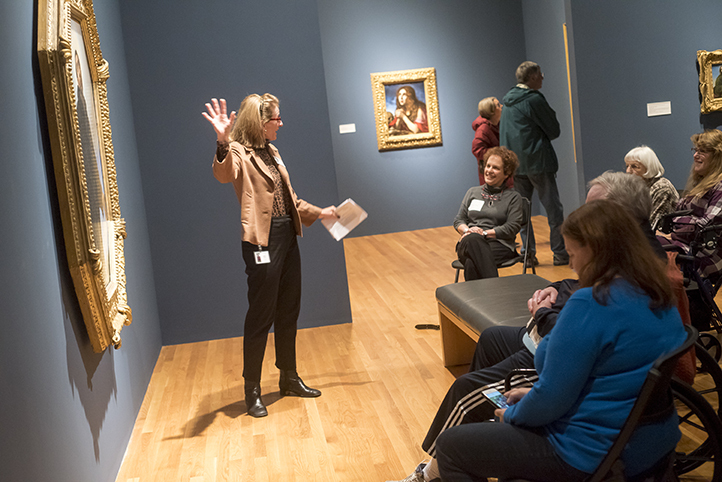 In April of 2017, Reflections tours were opened to the general public. 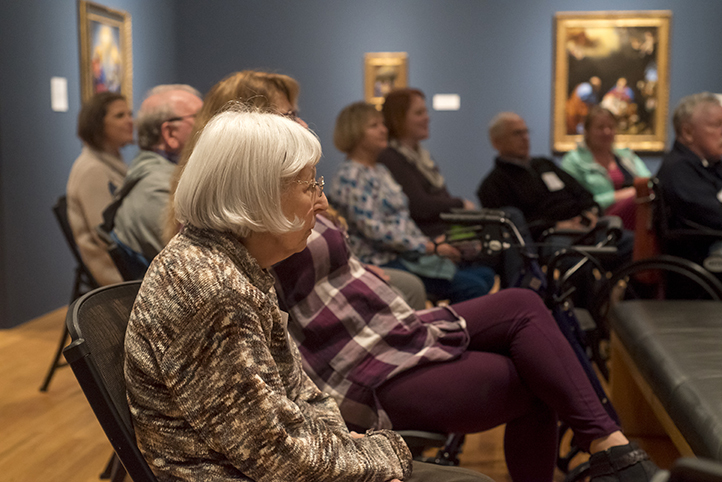 These public tours are now held on the fourth Tuesday of each month, and individuals in early and mid-stages of Alzheimer’s disease are invited to participate. Please fill out a form to sign up for a Reflections tour. 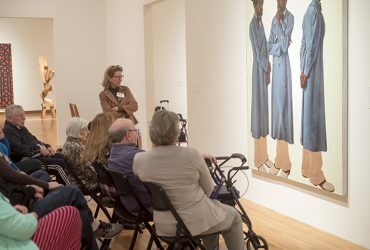 Between July 2014 and June 2018, over 2,000 individuals with dementia and their care partners toured the Nasher Museum with the Reflections Program. 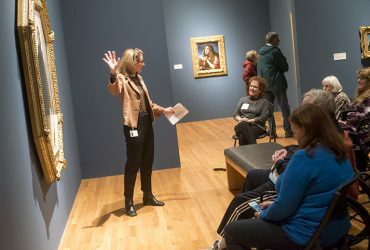 One hundred and fifty five tours were led by thirteen Gallery Guides (seven community members and six Duke undergraduate, graduate, or medical students). 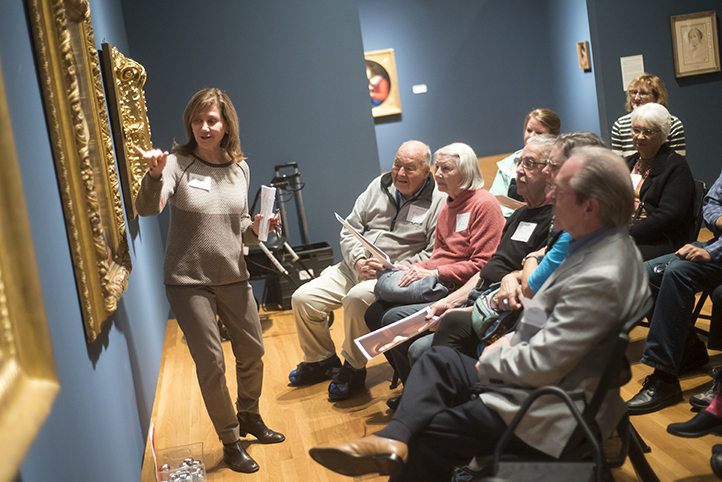 By 2016, the Nasher established close partnerships with Duke Family Support Services and Eno Pointe Assisted Living. In April of 2017, the Reflections Program hit a new milestone as tours were opened to the public, not only visitors with organized groups. 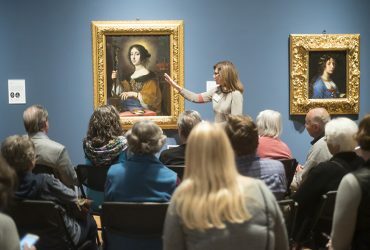 Visitors enjoy a guided Reflections tour to Carlo Dolci: The Medici's Painter exhibition. Photo by J Caldwell. 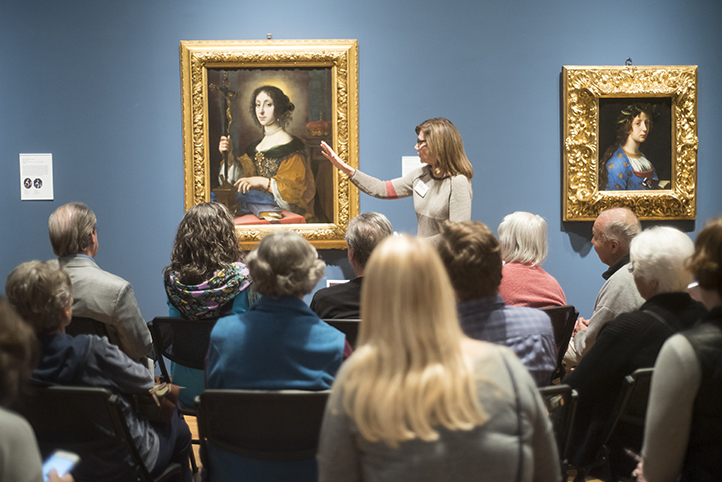 Visitors enjoy an animated Reflections tour to Carlo Dolci: The Medici's Painter exhibition. Photo by J Caldwell. 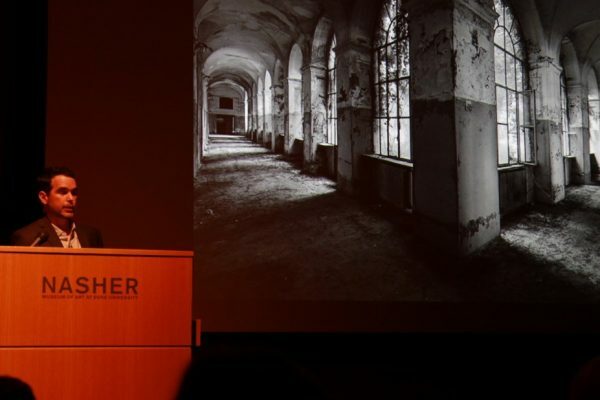 The Nasher Museum's collection includes several works of art related to memory. 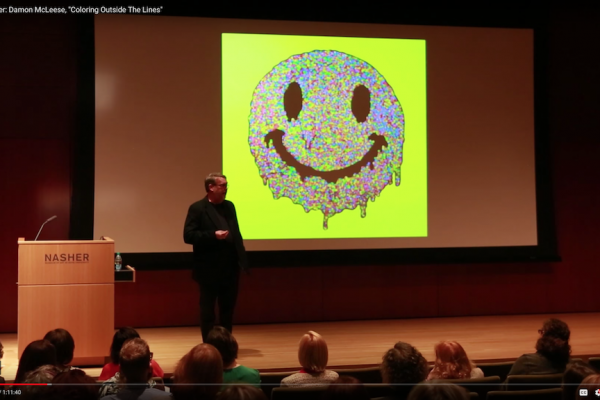 Memory can be a powerful subject in contemporary art. 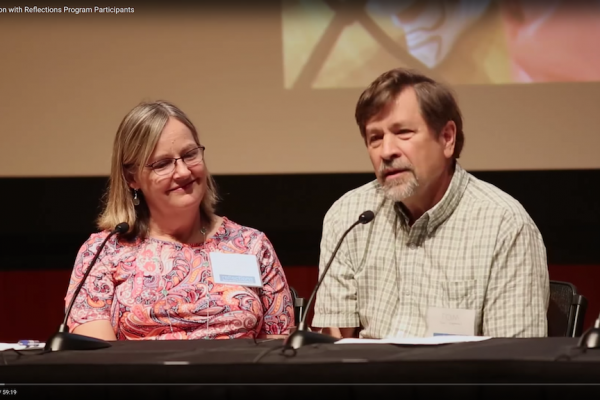 Above, watch a short documentary film about two families who are regulars on the “Look and Lunch” tours for visitors with Alzheimer’s. 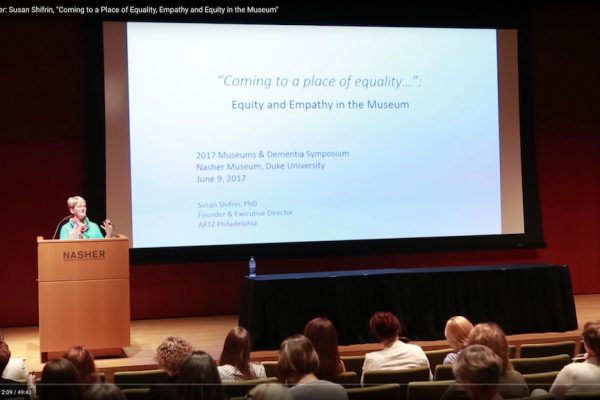 Kati Henderson, a Gallery Guide and former Duke graduate student, created this video for a class at the Duke Center for Documentary Studies. 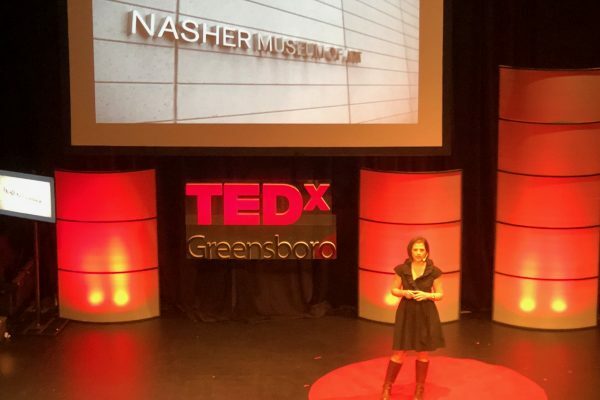 For information about supporting the Reflections Program, please contact Mary Catherine Hall at marycatherine.hall@duke.edu or call at (919) 684-3411. The Orange County Department on Aging has designated the Nasher Museum as “dementia-friendly” after museum staff took part in an intensive training workshop. 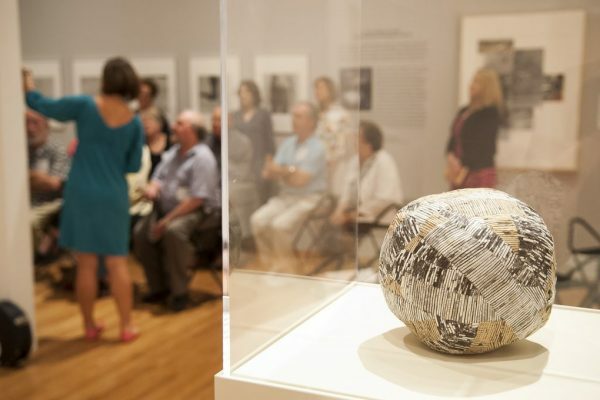 The Nasher group helped Orange County reach the 1,000th person trained through this program. 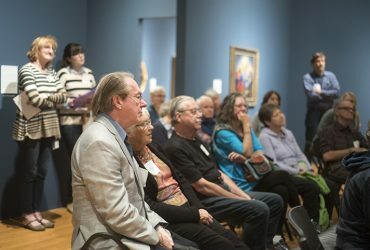 The Nasher Museum is proud to be part of the Dementia Friendly Community. 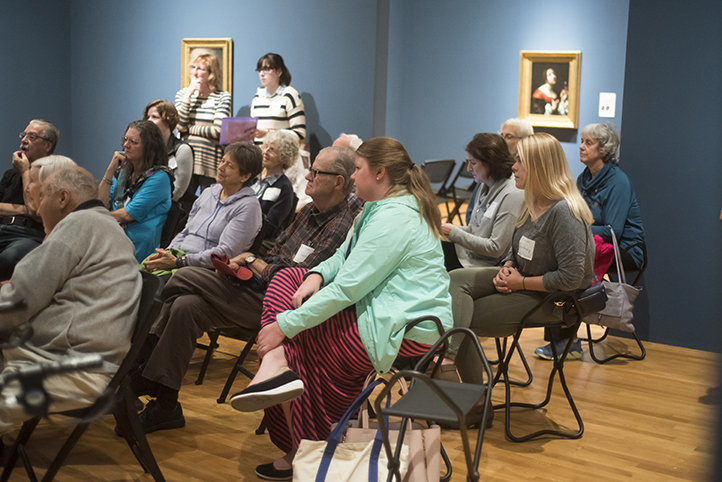 We had an amazing tour of "Reflections," which provides art therapy through free museum tours to individuals living with Alzheimer's disease, and their caregivers and families.